Why is aikido so good for kids? Aikido is non-competitive and non-aggressive. 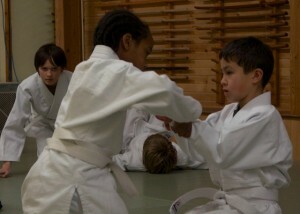 Through aikido, kids practice cooperation, awareness and concentration. They also learn respect for themselves and others. And Aikido is fun. What are the physical benefits of Aikido? Flexibility, body awareness, balance and stability in motion. Experienced Shugyo instructors teach the classes. Assistant instructors help to reinforce instruction and provide supervision. Come check us out. The first class is free. Your child can try a class and you’ll get a sense of what Aikido and the dojo are like. Your child can start any time. Instructors adjust classes to suit the levels of the children on the mat.